This will be the third year we've been to the Nightingale Centre, where Stella provides great full board accommodation. 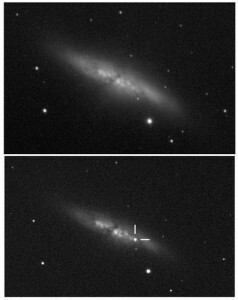 Last year we had some great viewing of the supernova in M82 Cigar Galaxy. It really did look like the picture, with the white "star" appearing distinctly against the Galaxy swirl. We have some great Eastern, Southern and Western views, with a large flat(ish) car park. We usually get permission to turn off the car park lights, shown in the virtual tour video. Take a look at the Nightingale Centre, its a great place! There is a charge for this weekend.